Sometimes the best cure for archive fever is to share it with the world. “Pa Raymond,” Sierra Leone Mission Album, box 2, p. 122, Records of the United Brethren in Christ Foreign Missionary Society, United Methodist Archives, Drew University. I was reminded of the mundane joys of the archive again several months ago when, thanks to a tip from a colleague, I located an extremely rare photograph of one of the survivors of the Amistad slave revolt in the United Methodist Archives in New Jersey. It is difficult to tell whether the old man, called “Pa Raymond” on the reverse of the photo, is the real deal, but circumstantial evidence suggests that he might be Kale Walu, or “Little Kale,” who was just a boy when he was abducted and enslaved in West Africa in 1839. Kale (also spelled Kali or Carly) was the author of the famous “crazy dolts” letter, addressed to John Quincy Adams on the eve of their trial in the United States Supreme Court. He assumed the name George Lewis when he returned to Africa in 1842, part of an ongoing project to reinvent former slaves as anglicized Christians. As one of the youngest among the returning group, he was something of a surrogate son for abolitionist missionary William Raymond and may have taken his surname later in life. Pa is Krio for “father,” an honorific title for village elders. The photo was probably taken sometime in the early 20th century by the United Brethren in Christ, who had inherited an abolitionist outpost, called the “Mendi Mission,” in what is now southwestern Sierra Leone. Almost all of the photos in the collection date from after the rebellion of 1898. 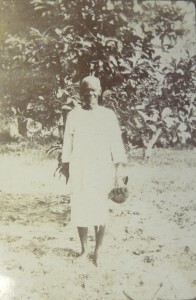 When Canadian missionary Alexander Banfield encountered a man claiming to be an Amistad veteran during a tour of Sierra Leone in 1917 (likely the same man in this photo), he estimated the man was about 100 years old. Although my work does not really focus on the Amistad captives (I’m interested in the larger story of American abolitionists in Africa), it is bracing to look into the eyes of this man. Sole survivor. Adopted son of the missionary, traveling barefoot through the bush. White-haired patriarch, holding something mysterious with his right hand. What have those eyes seen? Where are they looking now? Thanks to the generous (and underpaid and understaffed) archivists in New Jersey and the embattled public domain laws of the United States, I am able to share this treasure with the world (I think) for the first time. It belongs to the world. I am just returning it.